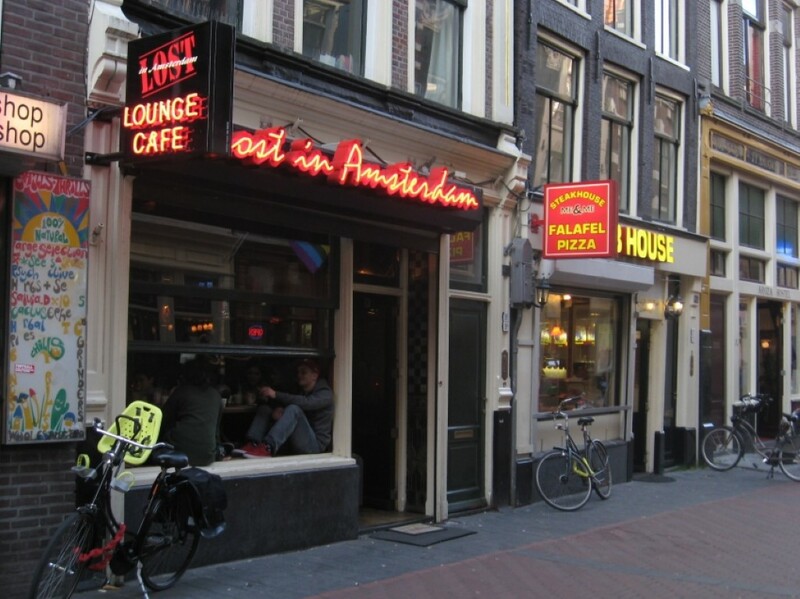 When You’re in Amsterdam visiting worlds most famous coffeeshops, You might be looking for a place to smoke your purchased cannabis or hashish – in combination with a drink and a good snack. Our west shops are take away coffeeshops, but in our center shop we have a smoke lounge, for max. 10 people and where it’s allowed to smoke pure only. The luxury leather chairs give you a super V.I.P. feeling while you’re enjoying your favorite product in the Utrechtsestraat. Due to the to the tobacco regulations, smoking tobacco is only allowed in special smoke rooms. Pure cannabis or herbal mix is allowed, if the owner allows this in their shop or café. You might be looking for a true bar to smoke and have a (alcoholic) drink or maybe even having a snack while you’re getting the munchies. This is also the perfect option when you’re visiting Amsterdam with a group of friends, and some of them don’t smoke, but love to have a drink while you’re enjoying your joint or vape! This is the newest (cannabis) hotspot in Amsterdam. You might recognize this logo and interior style from CoffeeshopAmsterdam – Haarlemmerstraat 44 (formerly known as Dampkring, but still the same owner and quality). After you purchased your favorite products you know where to go now. 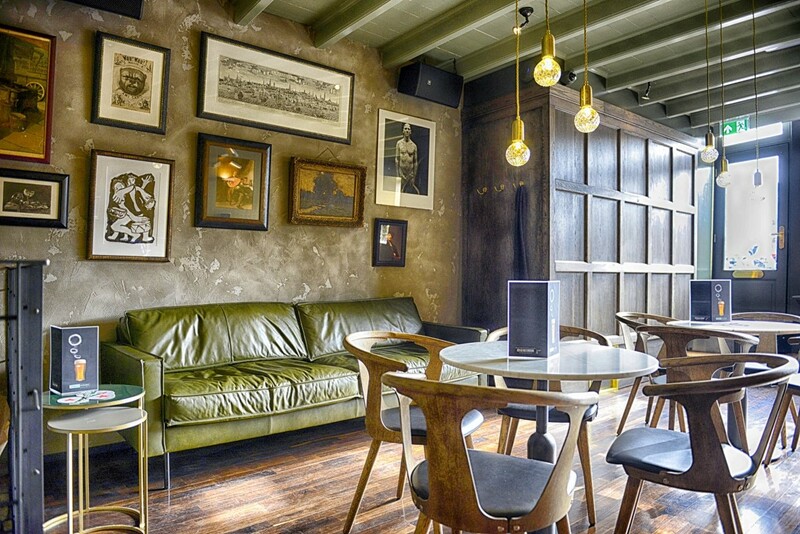 The open, clean and classy vibe is like no other smokers bar in Amsterdam. This sister café of CoffeeshopAmsterdam allows you to smoke pure or with (free) herbal mix. They offer alcoholic drinks, so why your non-smoking girlfriend is having her Gin-Tonic, you can smoke your joint! This is by far the most fancy place to enjoy cannabis! 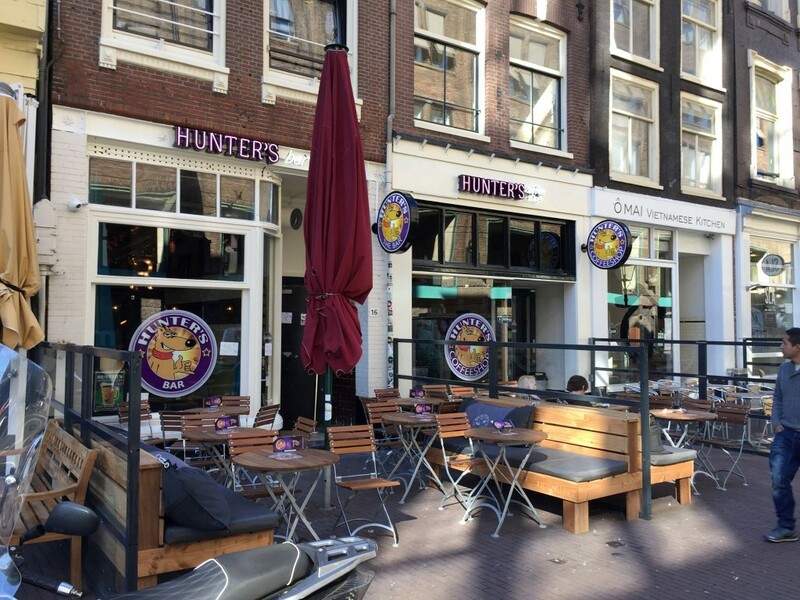 Close to Boerejongens Coffeeshop Center you’ll find Hunters Bar. When our Smoke Lounge is full, many customers visit this bar wich is located across our coffeeshop. Keep in mind: this is a true die hard smokers bar. The location is good, as it’s also around the corner of the busy Rembrantplein and at the beginning of the beautiful Utrechtsestraat, with many super fancy clothing boutiques. Hill Street Blues was formerly a coffeeshop. The bar is located in the Red Light area. The underground, arty, graffiti walls are typical and world-famous by smokers. 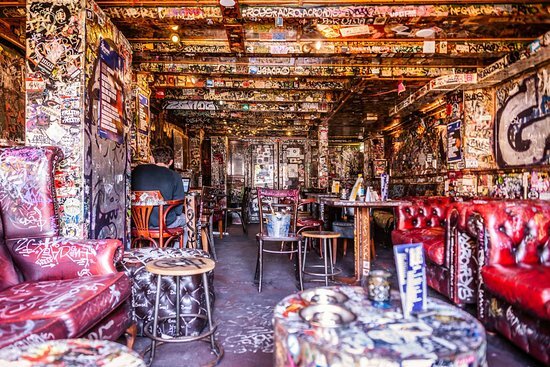 Hill Street Blues has a long history and they have often music evens going on. Perfect for a smoke and a drink with your friends. Lost in Amsterdam is a typical tourist café, with a cozy Moroccan style couches around and ofcourse they have plenty of waterpipes to smoke. They allow you to smoke pure cannabis too. The bar offers you a big variety of drinks and the public is mostly young. Also this bar is super close to the Coffeeshop Information Centre (Brand store of Amsterdam Genetics) and CoffeeshopAmsterdam Café, choose your favorite!